Phulkopir Roast (Bengali Style Cauliflower Roast) is a rich and spicy dry cauliflower dish, cooked in onion-tomato gravy and beautiful and fragrant Indian spices. Perfect with rice or roti. This has to be my best soul food ever. Happy Monday my lovely friends!! Hope you all had a fantastic weekend! 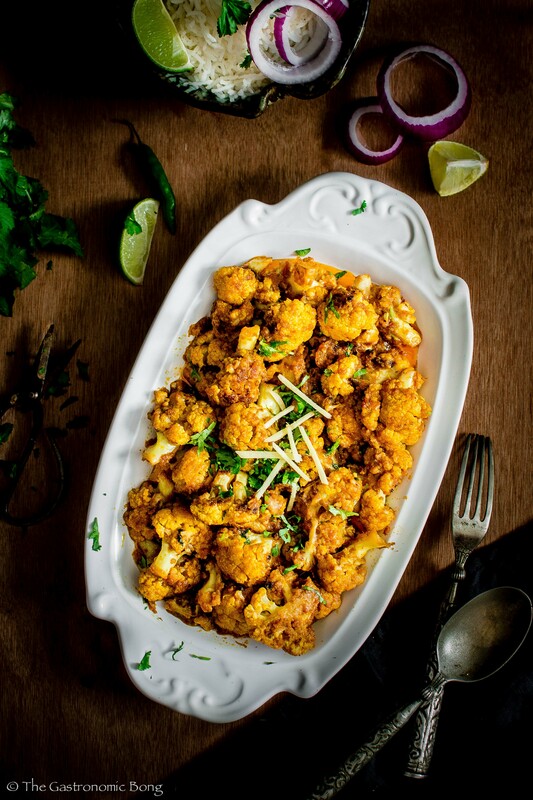 Let’s start this week with a wonderfully delicious cauliflower dish. 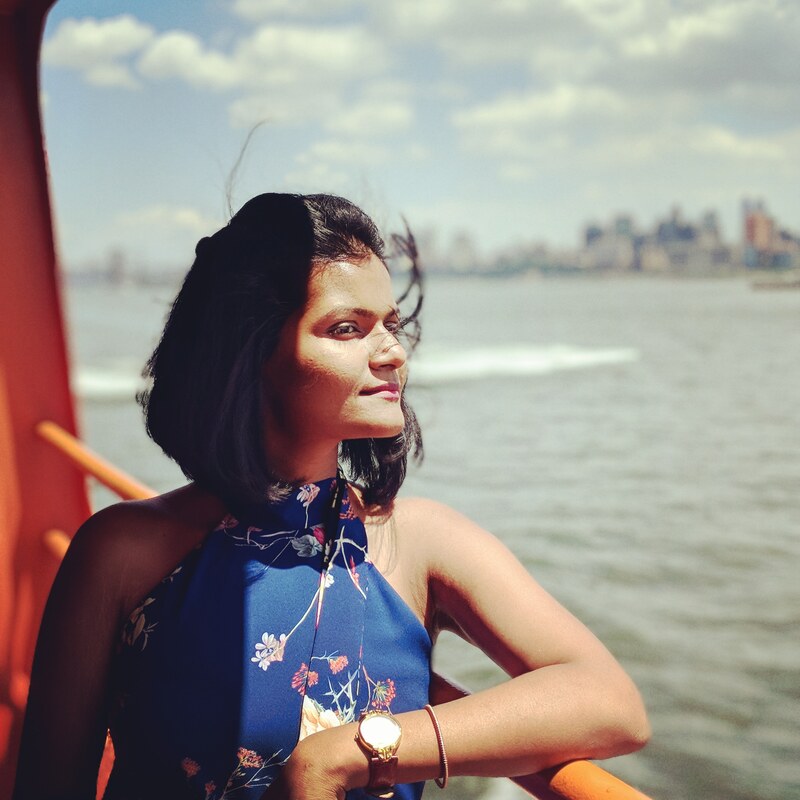 Today, I am sharing one of my most favourite recipe with you, something very close to my heart. My mom’s Phulkopir Roast (Bengali Style Cauliflower Roast), something that I have cherished and grown up eating. My mom make the best phulkopir (cauliflower) roast ever. Really, you will know it if you try it. It took me ages to perfect this recipe. But still sometimes, I feel I can never match her. 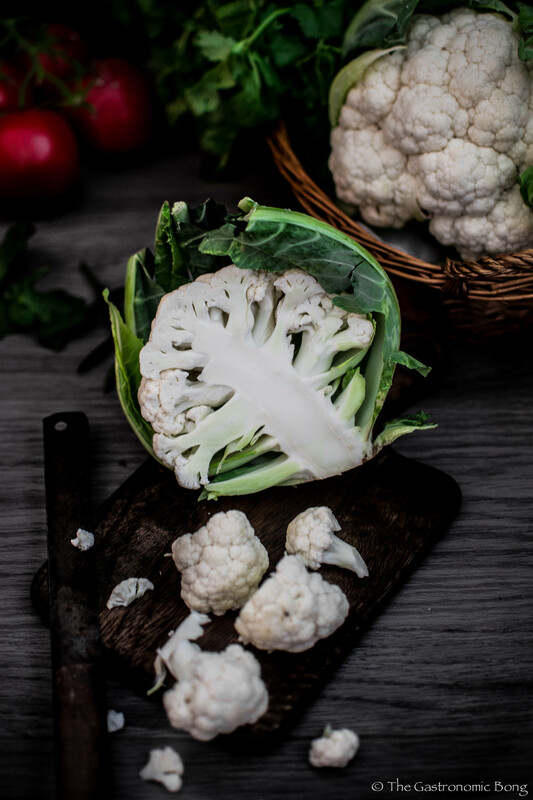 Cauliflower is a nutrient dense and a versatile vegetable. It offers varied textures as in it can be mashed just like potatoes or cooked with different masalas or can be used as a low carb pizza base or cauliflower steaks and now the new favourite is cauliflower rice in keto diet. It offers so many textures and flavour absorption. Prepare it anyways and it never fails to surprise you. There are many ways to prepare cauliflower in Bengali cuisine as well. Phulkopir dalna is the most common and delicious way to prepare it. Bengalis also use cauliflower in fish curries and egg curries and it is just perfect everything. Now back to this Bengali cauliflower roast. It may sound like roasting a whole head of cauliflower, but it is not. Hehe.. This is a rich, delicious and a spicy dish. 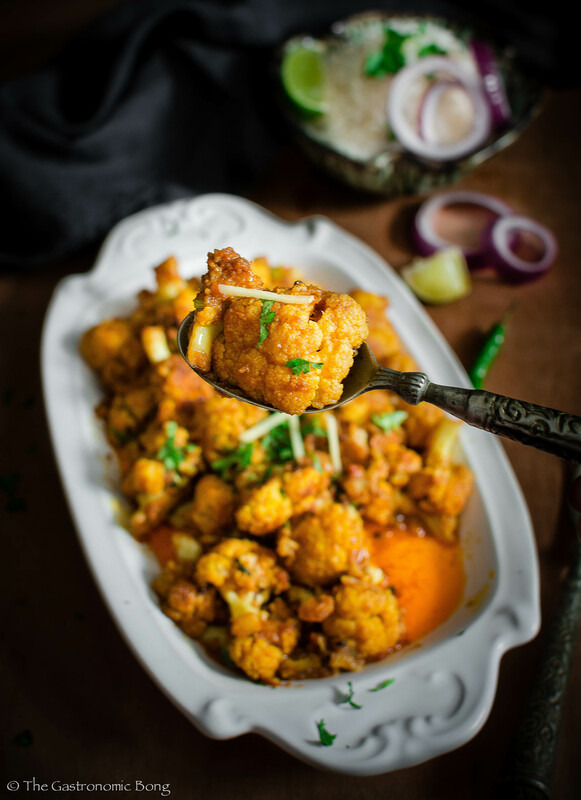 Big cauliflower florets are fried till golden brown and then cooked in a spicy onion-tomato paste along with warm and fragrant Indian spices. The fried cauliflower florets along with the masalas is just like flavour bomb in your mouth. It is a semi-dry to dry dish and can be eaten with hot steaming basmati rice or Indian flat bread. 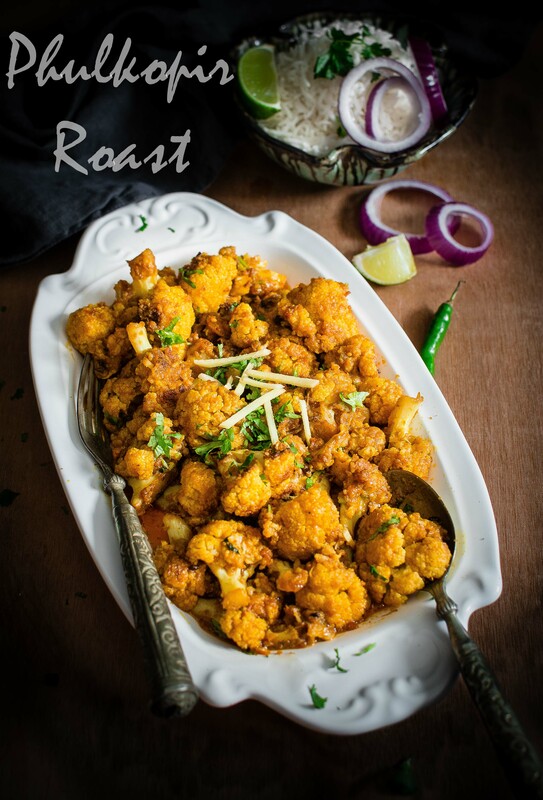 Phulkopir Roast (Bengali Style Cauliflower Roast) is a rich and spicy cauliflower dish, cooked in onion-tomato gravy with warm, beautiful and fragrant Indian spices. Perfect with rice or roti. This has to be my best soul food ever. Marinate the caulifliower florets with some salt and turmeric powder. Make a coarse paste of onion , tomato, ginger, garlic and chillies. Heat 2-3 tbsp oil in a thick bottomed pan and fry the cauliflower till golden brown. Remove with slotted spoon and keep it aside. Now in the same pan heat the rest of the oil on medium heat, then add the dried red chilli and the methi seeds. When it splatters add the onion-tomato paste and fry on medium heat, stirring constantly. Fry the paste till the oil separates from the sides. Then add the chilli powder, turmeric powder, cumin powder coriander powder, salt add 2 tbsp of water and fry for few minutes. Now toss in the fried cauliflower florets along with 3/4 cup of water and simmer till the cauliflower is cooked through. If you want a dry gravy simply crank up the heat until you get the desired consistency. Lastly add the garam masala powder and aamchur powder (dried mango powder) and mix everything well. Sprinkle with some chopped coriander leaves and serve it with rice or roti. I hope you enjoy this Phulkopir roast as much as we do! If you have tried this recipe simply tag #gastronomicbong or @gastronomicbong on Instagram or facebook or twitter.